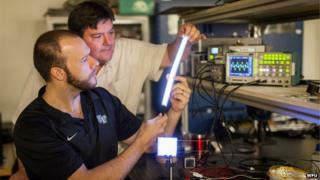 US researchers say they have developed a new type of lighting that could replace fluorescent bulbs. The new source is made from layers of plastic and is said to be more efficient while producing a better quality of flicker-free light. The scientists behind it say they believe the first units will be produced in 2013. Details of the new development have been published in the journal Organic Electronics. The new light source is called field-induced polymer electroluminescent (Fipel) technology. It is made from three layers of light-emitting polymers, each containing a small volume of nanomaterials that glow when electric current is passed through them. The inventor of the device is Dr David Carroll, professor of physics at Wake Forest University in North Carolina. He says the new plastic lighting source can be made into any shape, and it produces a better quality of light than compact fluorescent bulbs which have become very popular in recent years. "They have a bluish, harsh tint to them, " he told BBC News, "it is not really accommodating to the human eye; people complain of headaches and the reason is the spectral content of that light doesn't match the Sun - our device can match the solar spectrum perfectly. "I'm saying we are brighter than one of these curlicue bulbs and I can give you any tint to that white light that you want." There have been several attempts to develop new light-bulbs in recent years - Light Emitting Diodes (LEDs) have come a long way since they were best known for being indicator lights in electronic devices. Over the past decade, they have become much more widely used as a light source as they are both bright and efficient. They are now often used on large buildings. Another step forward has been organic LEDs (OLEDs) which also promise greater efficiency and better light than older, incandescent bulbs. Their big advantage over LEDs is that they can be transformed into many different shapes including the screens for high-definition televisions. But Prof Carroll believes OLED lights haven't lived up to the hype. "They don't last very long and they're not very bright," he said. "There's a limit to how much brightness you can get out of them. If you run too much current through them they melt." The Fipel bulb, he says, overcomes all these problems. "What we've found is a way of creating light rather than heat. Our devices contain no mercury, they contain no caustic chemicals and they don't break as they are not made of glass." Prof Carroll says his new bulb is cheap to make and he has a "corporate partner" interested in manufacturing the device. He believes the first production runs will take place in 2013. He also has great faith in the ability of the new bulbs to last. He says he has one in his lab that has been working for about a decade.